“I just wanted to say thank you to you guys—for doing all of this,” said a soft-spoken man who once came up to our table during the very last hour of clinic just to express his gratitude. Upon hearing his words, my heart warmed. It was only my second time volunteering back then, but I could already see the impact that the Riverside Free Clinic was making within the community. Each clinic, I get to work with an amazing team of caring and dedicated physicians, medical students, recent graduates, and other undergraduate students like myself. Like many other new volunteers, I was afraid of not being able to keep up with the flow. But, I quickly found that everyone was really friendly and willing to help. With their support and guidance, I soon got the hang of things. I’ve also had the pleasure of talking with some of the pharmacy and dental volunteers, as well as a few counseling support volunteers from Redlands University, and they’re just as wonderful. I’ve been learning new things from various people every clinic, especially through shadowing and observing patient-physician relationships, by talking with other committees, and from hearing diverse perspectives. As such, I am truly fortunate and proud to be part of this large community that does so much for everyone involved. It’s been quite a humbling and inspiring experience so far, and I’m really excited to continue our progress in the upcoming months. So as we move forward, here’s to a new year of growth, of strengthened community, and of improved health for the lives of many. 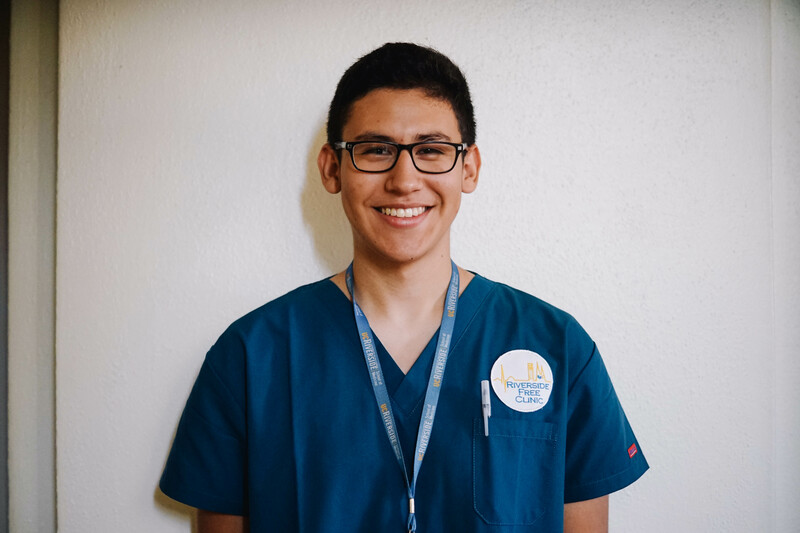 "Besides learning medical knowledge and gaining hand-on experiences, the most valuable experience I gained through Riverside Free Clinic (RFC) is knowing how to serve and assist people’s needs. It is extremely important to comprehend the patients’ need, yet respect and give them the autonomy to make their own choices and decisions. Sometime, it simply takes an attentive ear and an empathetic heart to understand the difficulties each patient is going through in his or her life. As a volunteer, I not only can help the clinic run smoothly, more importantly providing the care and attention the patients need by directing them either to the medical students or the various resources and committees established in RFC. As a Social Service Committee member, I believe three of our most popular-demanded resources are optometry, dentistry, and the locations of Riverside County Hospitals. For optometry, there is two programs where one provides an eye exam while the other provides glasses. For dentistry, we lists several other clinics around that provide dental care. As for the Riverside County Hospitals' locations, they are mainly used to direct patients to see specialists or other care that they need but are not provided in the clinic. There are many other resources include nearby shelters, women's resources, etc. Some of the resources and programs have their own requirements, but many patients find themselves eligible for them anyway, so please don't hesitate to ask us about the resources you need! All the Social Service Committee members are eager to assist patients in the RFC with the resources they need. I hope patients can utilize the resources in Social Service Committee and give us suggestions on any additional resources they want in order to improve our committee to meet the needs of this community. To me, RFC is not just a free clinic; it is a clinic based on trust, support, and the cooperation and endeavor of many people from different campuses. Furthermore, RFC gives me an opportunity to not just be a passenger, but to become someone who is truly connecting with and contributing to the society around her." "The first day I volunteered at the clinic with Medical-Spanish I was afraid of being alone, being unable to contribute and lastly of being judged. Yet, when I first entered the clinic I saw that everybody within the staff was extremely friendly, warm and overall welcoming. I began to assimilate into the daily tasks of a volunteer setting up for clinic. Once the patients began to enter the church seeking medical attention I thought that it would be a while before I would be asked to begin translating for medical students, however the wait was brief. As I approached my first patient I was afraid that I would be unable to translate certain words or even understand the patient. When I, along with the medical students and patient sat down I lost all my fears. I put everything in perspective and realized how fortunate I was to be part of such an amazing organization. The patient opened up to everyone on the table and admitted that she was undocumented and could not afford insurance so to her the clinic was a blessing. To some patients the clinic is all they have and to see how much the medical staff cares for the patient and how appreciative the patient is cannot be described with any word other than simply beautiful. I feel extremely fortunate to be part of the Riverside Free Clinic because I am doing something that I truly love. Helping disadvantaged people through the practice of medicine along with a mixture of passion and kindness. As I attend more and more clinics I began to see that the same patients continued to return regularly and even brought friends along with them. Simply knowing that patients recommended their friends is more than enough to know that the clinic is having a significant positive impact on the lives of many. In Medical-Spanish I am able to see first hand the joy medical students and doctors get from helping a patient. Looking at the medical staff read the laboratory results that say the patient is no longer diabetic or significantly lowered their blood pressure and having the pleasure of telling the patient the good new in their native tongue is an amazing opportunity. Helping people improve and maintain their health with support and professionalism is what the Riverside Free Clinic is all about, helping the underserved community of riverside with compassion while at the same time getting results." "Stress is something that we’ve all encountered before. Although stress may be a common part of our lives, the effects of it can be detrimental to one’s health if not properly handled. As I recognized the importance of coping with this negative feeling, I was blessed with the amazing opportunity to become a member of the Stress Relief Committee. During a Stress Relief class, I remember one patient who wrote down “hopeless” when I asked how he was feeling that day. After teaching an innovative and fun class, I asked the patient to write down how he currently felt after the session. I saw the word “hopeful” written on the paper. A simple change in the word “hope” hit me in ways I never knew could. I was vastly moved by the outcome of this patient, and only aspire to make future patients feel the same way. The results at the end of each class are, nonetheless, a humbling experience that I will hold with me as I continue my journey in the health field. Even though I am informing patients about stress reducing techniques, I am ultimately learning from them at the end of the day. To know that I can make a difference in someone’s life is beyond gratifying. The positive experiences that I have come across have proved my invested time to be worthwhile and I am inspired by patients every day to continue what I love to do­ ­-- helping you." Welcome to Riverside Free Clinic!